Coordinates: 25°59′N 85°08′E﻿ / ﻿25.99, 85.13 Vaishali, or Vesali (Pali), had been the capital of the Licchavis and the Vajjian Confederacy. In Buddha's time, Vesali had been a heavily populated, major city, rich and prosperous. 7,707 pleasure grounds, and an equal number of lotus ponds, filled the city. Ambapali, a courtesan famed for her beauty, drew many to live and work there. The city had three walls, one gávuta away from the other, and watch towers stood at three places in the walls' gates. Buddhaghosa mentions that the name Vesali became synonymous with "expansive." Outside the town, a large, natural forest, called the Mahavana, lead uninterruptedly up to the Himalayas. Other forests, such as Gosingalasála, spread expansively near by. The city went by the name Visálá at that time. 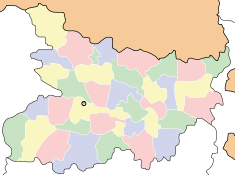 Vesali sat where the village of Basrah in Vaishali District exists today. 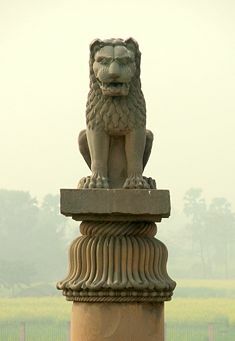 Vaishali has a claim to fame for its wealth and prosperity since before the advent of Jainism and Buddhism, and for possibly becoming with world's first Republic. Yet, the claim to fame that has been most secure for more than 2000 years has been Buddha's connection with the city. During a dire drought and pestilence, Buddha traveled to the city upon request from the city government, to drive evil spirits responsible for the deaths out. He succeeded in doing that. He visited Vaishali many times during his Enlightenment, delivering sermons, admitting women into the order for the first time, and announcing his impending death. Vaishali derives its name from King Vishal, of the Mahabharata age. 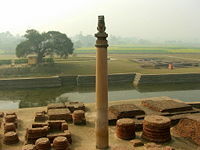 Even before the advent of Buddhism and Jainism, Vaishali served as the capital of the vibrant republican Licchavi state since before the birth of Mahavira (c. 599 B.C.E.). That suggests Vaishali may have been the first republic in the world, similar to those later found in ancient Greece. In that period, Vaishali had been an ancient metropolis and the capital city of the republic of the Vaishali state, which covered most of the Himalayan Gangetic region of present-day Bihar state, India. Few records remain that describe the early history of Vaishali. The Vishnu Purana records thirty-four kings of Vaishali, the first being Nabhaga, believed to have abdicated his throne over a matter of human rights and believed to have declared: "I am now a free tiller of the soil, king over my acre." The last among the thirty-four, Sumati, was considered a contemporary of Dasaratha, father of the Hindu god, Lord Rama. Stupa with relics of Ananda (Buddha's attendant monk and cousin), with Asokan pillar, at Vaishali, Bihar, India. Texts pertaining to both Jainism and Buddhism, which have preserved much information on Vaishali and the other Maha Janapadas, make numerous references to Vaishali. 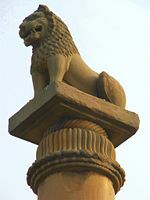 Based on the information found in those texts, Vaishali had been established as a republic by the sixth century B.C.E., prior to the birth of Gautama Buddha in 563, making it the world's first republic. Lord Mahavira had been born in the republic of Vaishali. Gautama Buddha delivered his last sermon at Vaishali and announced his Parinirvana there. Vaishali, also renowned as the land of Ambapali (also spelled as Amrapali), the great Indian courtesan, appeared in many folktales, as well as in Buddhist literature. Ambapali became a disciple of Buddha. Abhishek Pushkarini, the coronation tank, sits a kilometer away. The sacred waters of the tank anointed the elected representatives of Vaishali. Next to it stands the Japanese temple and the Vshwa Shanti Stupa (World Peace Pagoda) built by the Nipponzan Myohoji sect of Japan. 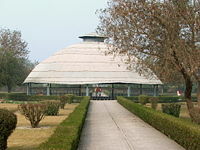 A small part of the Buddha's relics found in Vaishali have been enshrined in the foundation and in the chhatra of the Stupa. Near the coronation tank sits Stupa 1 or the Relic Stupa. There the Lichchavis reverentially encased one of the eight portions of the Master's relics, which they received after the Mahaparinirvana. After his last discourse, the Awakened One set out for Kushinagar, but the Lichchavis kept following him. Buddha gave them his alms bowl but they still refused to return. The Master created an illusion of a river in spate which compelled them to go back. That site can be identified with Deora in modern Kesariya village, where Ashoka later built a stupa. Ananda, the favorite disciple of the Buddha, attained Nirvana in the midst of the Ganga outside Vaishali. The Buddha first visited Vaishali in the fifth year after his Enlightenment, and spent the rainy season there. The Buddhist Theravadin Commentaries give detailed descriptions of the circumstances of this visit. Seven thousand and seven rajas inhabited Vesáai, each of whom had large retinues, many palaces and pleasure parks. There came a shortage in the food supply owing to drought, people dying in large numbers. The smell of decaying bodies attracted evil spirits, and intestinal disease afflicted many inhabitants. The people complained to the ruling prince, and he convoked a general assembly, where they decided, after much discussion, to invite the Buddha to their city. As the Buddha then resided at Veluvana in Rajagaha, the Licchavi Maháli, friend of King Bimbisara and son of the chaplain of Vesali, went to Bimbisara with a request that he should persuade the Buddha to go to Vesáli. Bimbisára referred him to the Buddha himself, who, after listening to Maháli's story, agreed to go. The Buddha started on the journey with five hundred monks. Bimbisára decorated the route from Rájagaha to the Ganges, a distance of five leagues, and provided all comforts on the way. He accompanied the Buddha, and they reached the Ganges in five days. Boats, decked with great splendour, prepared to take the Buddha and his monks, and legends relates that Bimbisára followed the Buddha into the water up to his neck. The Licchavis received the Buddha on the opposite bank with even greater honor than Bimbisára had shown him. As soon as the Buddha set foot in the Vajjian territory, a thunderstorm erupted and rain fell in torrents. The distance from the Ganges to Vesáli measured three leagues; as the Buddha approached Vesáli, Sakka came to greet him, and, at the sight of the devas, all the evil spirits fled in fear. Relic Stupa at Vaishali. A temporary roof protects the excavated ancient stupa of the Licchavis. In the evening, the Buddha taught Ananda the Ratana Sutta, ordering that it should be recited within the three walls of the city, the round of the city being made with the Licchavi princes. That Ananda accomplished during the three watches of the night, and all the pestilences of the citizens disappeared. The Buddha himself recited the Ratana Sutta to the assembled people, and eighty four thousand beings converted. After repeating that for seven consecutive days, the Buddha left Vesáli. The Licchavis accompanied him to the Ganges with redoubled honors and, in the river itself, Devas and Nágas vied with each other in paying him honor. On the farther bank, Bimbisára awaited his arrival and conducted him back to Rájagaha. On his return there, the Buddha recited the Sankha Játaka. The records of Buddha's visits to Vesálimany infer that he visited several times. Records indicate that Buddha laid down various Vinaya rules at Vesáli. The visit mentioned in the last context seems to have been a long one; on that occasion, the Buddha ordered the monks to turn their bowls upon the Licchavi Vaddha. During a stay in Vesáli, where he had gone from Kapilavatthu, Mahapajapati Gotami followed the Buddha with five hundred other Sakyan women. With the help of Ananda's intervention, he obtained permission for women to enter the Order under certain conditions. The books describe, at some length, the Buddha's last visit to Vesali on his way to Kusinara. On the last day of that visit, after his meal, he went with Ananda to Cápála cetiya for his siesta, and, in the course of their conversation, he spoke to Ananda of the beauties of Vesáli: Of the Udena cetiya, the Gotamaka cetiya, the Sattambaka cetiya, the Bahuputta cetiya, and the Sárandada cetiya, where a Kapinayha-cetiya had also been mentioned. All those once served as shrines dedicated to various local deities, but after the Buddha's visit to Vesáli, they converted them into places of Buddhist worship. Other monasteries also had been mentioned, in or near Vesáli (for example, Pátikáráma, Válikáráma). The Buddha generally stayed at the Kutagarasala during his visits to Vesáli, but it appears that he sometimes lived at those different shrines. During his last visit to the Cápála cetiya he decided to die within three months, and informed Mára and, later, Ananda, of his decision. The next day he left Vesáli for Bhandagama, after taking one last look at the city, "turning his whole body round, like an elephant." The rainy season which preceded that, the Buddha spent at Beluvagama, a suburb of Vesáli, while the monks stayed in and around Vesáli. On the day before he entered into the vassa, Ambapáli invited the Buddha and the monks to a meal, at the conclusion of which she gave her Ambavana for the use of the Order. The Maháli, Mahásíhanáda, Cúla Saccaka, Mahá Saccaka, Tevijja, Vacchagotta, Sunakkhatta, and Ratana number among important suttas preached at Vesáli. After the Buddha's death, followers enshrined a portion of his relics in the city. One hundred years later, Vesáli again became the scene of interest for Buddhists, on account of the "Ten Points" raised by the Vajjiputtaká (q.v. ), and the Second Buddhist Council held in connection with that dispute at the Valikarama. Vesáli served as a stronghold of the last Jain Tirthankar Mahavira aka Niganthas, and legend records that of the forty two rainy seasons of the latter part of Mahavira's ascetic life, he passed twelve at Vesáli. Vesáli served as the residence of Kandaramasuka and Pátikaputta. Among eminent followers of the Buddha who lived in Vesáli, special mention has been made of Ugga (chief of those who gave pleasant gifts), Pingiyani, Karanapali, Siha, Vasettha, and various Licchavis. The Buddha's presence in Vesáli created a source of discomfort to the Niganthas, and mention is made of various devices resorted to by them to prevent their followers from coming under the influence of the Buddha. Near the coronation tank stands Stupa 1 or the Relic Stupa. Here the Licchavis reverentially encased on of the eight portions of the Master's relics, which they received after the Mahaparinirvana. After his last discourse, the Awakened One set out for Kushinagar, but the Lichchavis kept following him. Buddha gave them his alms bowl but they still refused to return. The Master created an illusion of a river in spate which compelled them to go back. That site can be identified with Deora in modern Kesariya village, where Ashoka later built a stupa. Kutagarasala Vihara had been the monastery where Buddha most frequently stayed while visiting Vaishali. Located three kilometres from the relic Stupa, on its grounds reside the Ananda Stupa, with an Asokan pillar in excellent condition (perhaps the only complete Asokan pillar left standing), and an ancient pond. A few hundred metres from the Relic Stupa sits Abhishek Pushkarini, the coronation tank. The sacred waters of the tank anointed the elected representatives of Vaishali. Next to the coronation tank stands the Japanese temple and the Vshwa Shanti Stupa (World Peace Pagoda) built by the Nipponzan Myohoji sect of Japan. 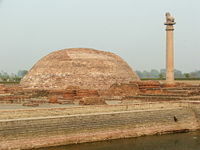 A small part of the Buddha's relics found in Vaishali have been enshrined in the foundation and in the chhatra of the Stupa. ↑ Vincent Smith, J.R.A.S. (1907). ↑ Encyclopedia Brittanica, Vaisali. Retrieved August 5, 2008. Caturasena. Vaiśālī kī nagaravadhū Buddhakālīna itihāsa-rasa kā maulika upanyāsa. Bhāgalapura: Śāradā Prakāśana, 1959. Jha, Hit Narayan. The Licchavis of Vaiśālī. Varanasi: Chowkhamba Sanskrit Series Office, 1970. Mishra, Yogendra. Vaiśālī-Abhinandana Grantha = Homage to Vaiśālī. Vaishali, Bihar, India: Research Institute of Prakrit, Jainology, and Ahimsa, 1985. Sharma, Jagdish Prasad. Vaisali World's First Republic. Delhi: Academic Excellence, 2007. ISBN 9788189901073. Sinha, B.P., and Sita Ram Roy. Vaiśālī Excavations, 1958-1962. Patna: Directorate of Archaeology and Museums, Bihar, 1969. History of "Vaishali (ancient city)"
This page was last modified on 14 January 2016, at 16:01.